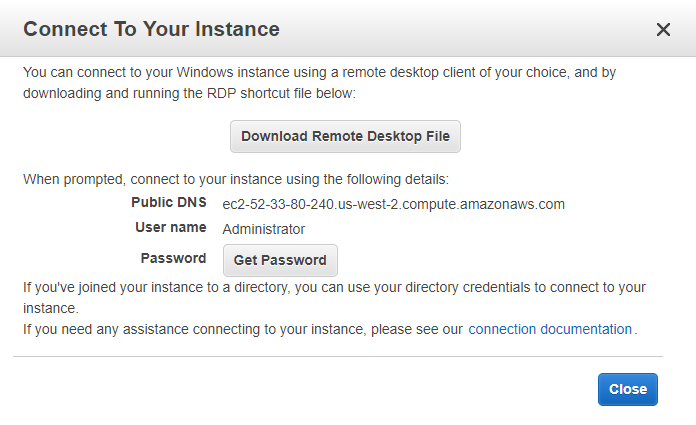 In this walkthrough we will setup RavenDB on an AWS EC2 t2.micro Windows virtual machine. Select your operating system. 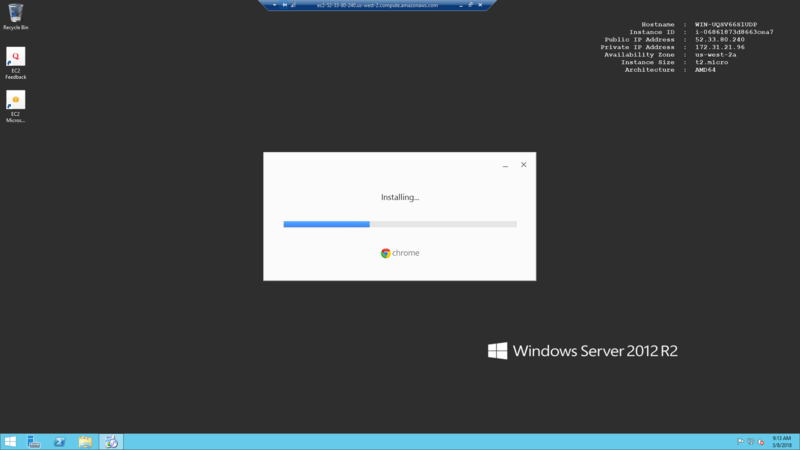 In our example we choose "Microsoft Windows Server 2012 R2 Base". 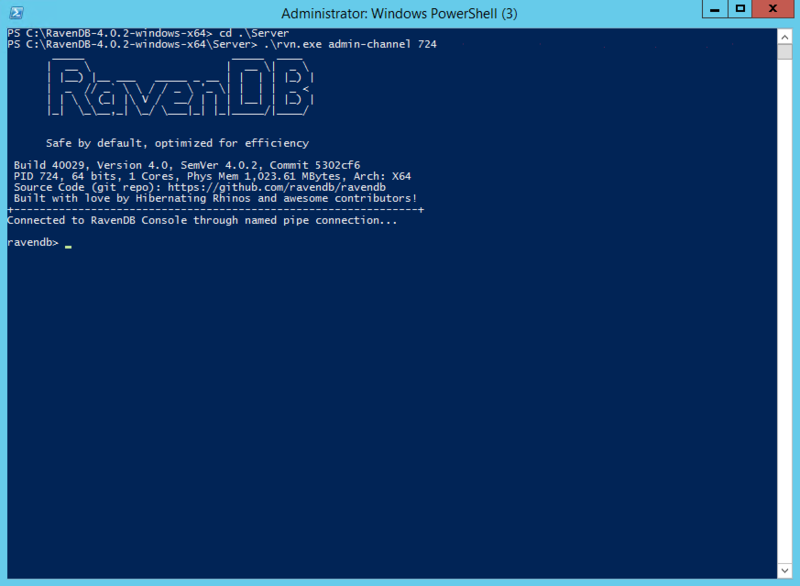 We stick with the basic default settings of the machine and configure just the minimal requirements for RavenDB. 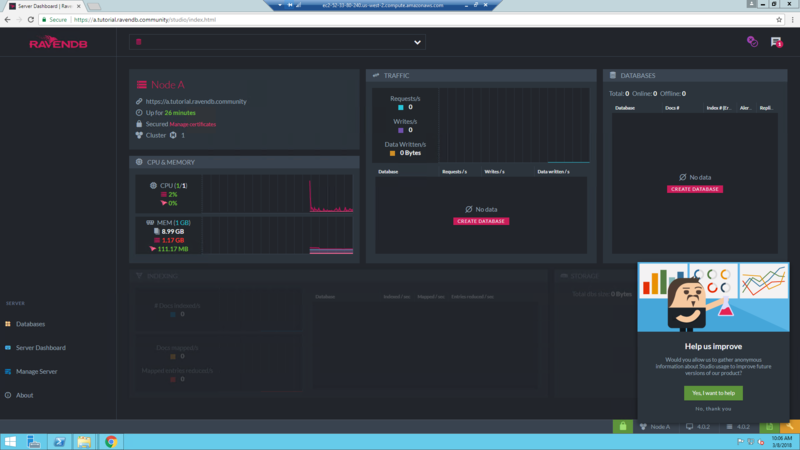 You would probably want to go over the entire set of options and customize your VM. 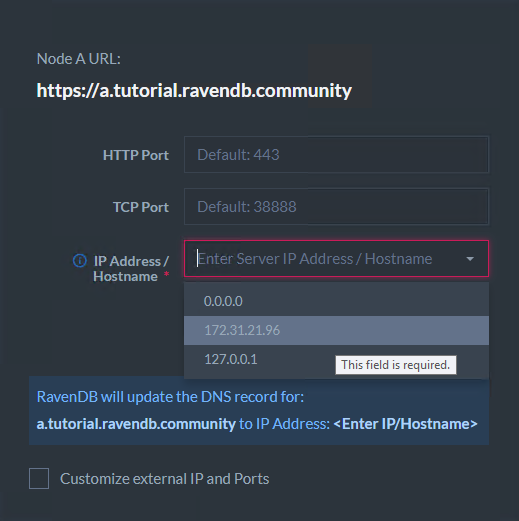 Let's open ports 443 and 38888 for use by RavenDB. 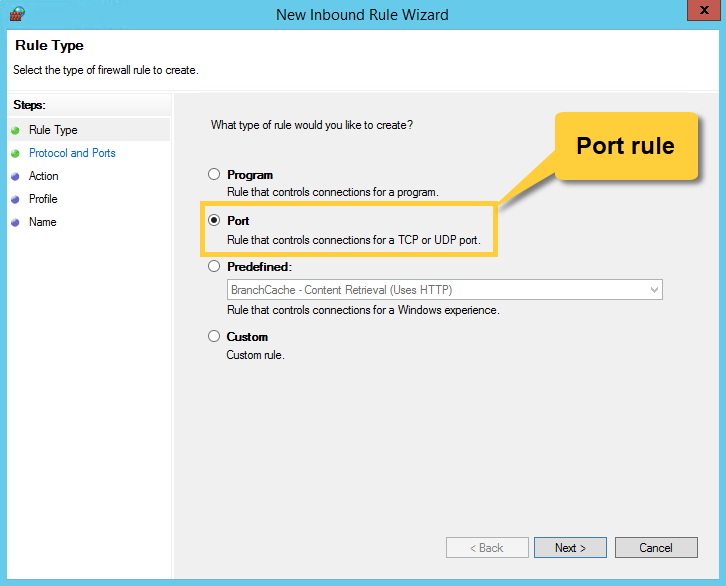 You may choose other port numbers of course and restrict access by IP. 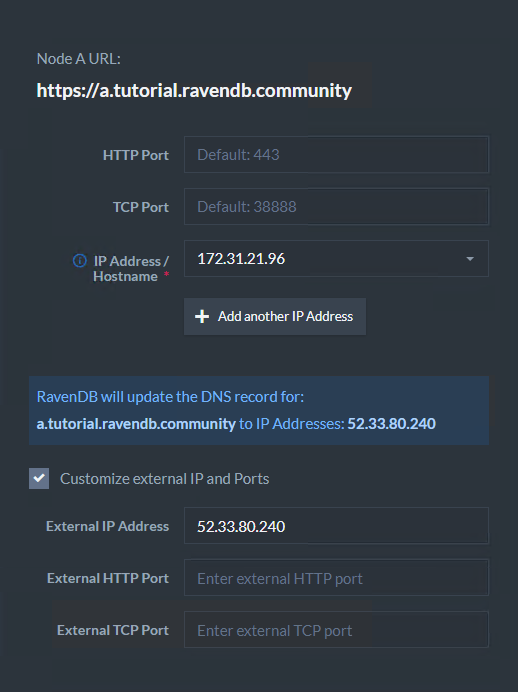 RavenDB will use port 443 for HTTPS requests and port 38888 for TCP connections. We allow all incoming traffic on these ports by using 0.0.0.0. 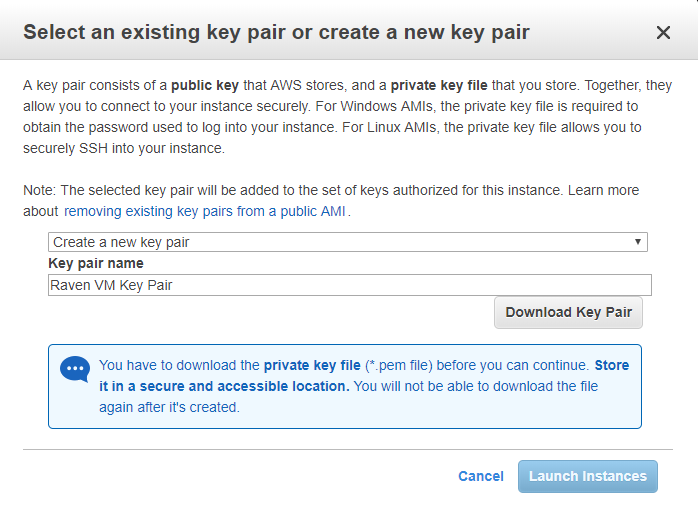 You will have to download a key pair which will be used later to set the Windows password. Get your password and download the Remote Desktop File. Connect to the VM. 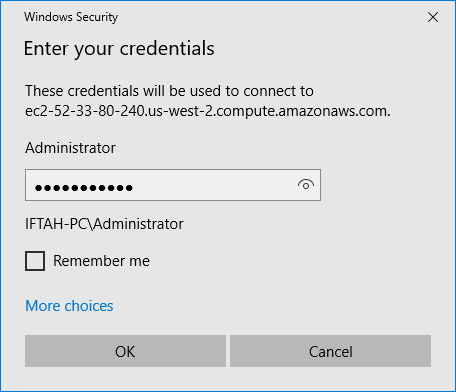 Use the username "Administrator" and the password you just received. 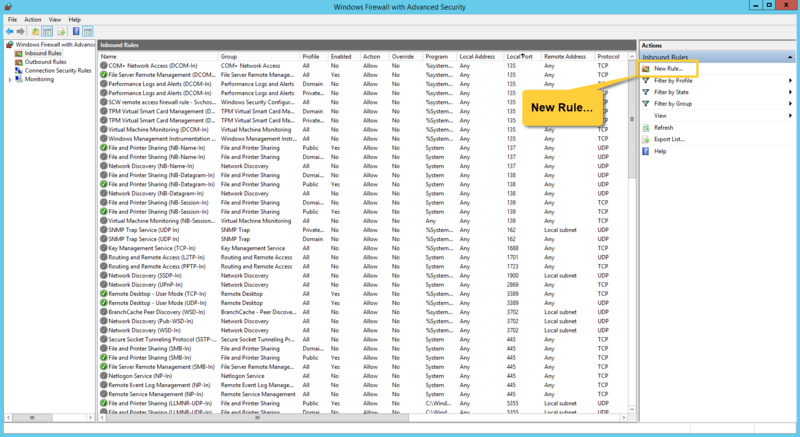 Open the "Windows Defender Firewall with Advanced Security" and go to the "Inbound Rules" tab. 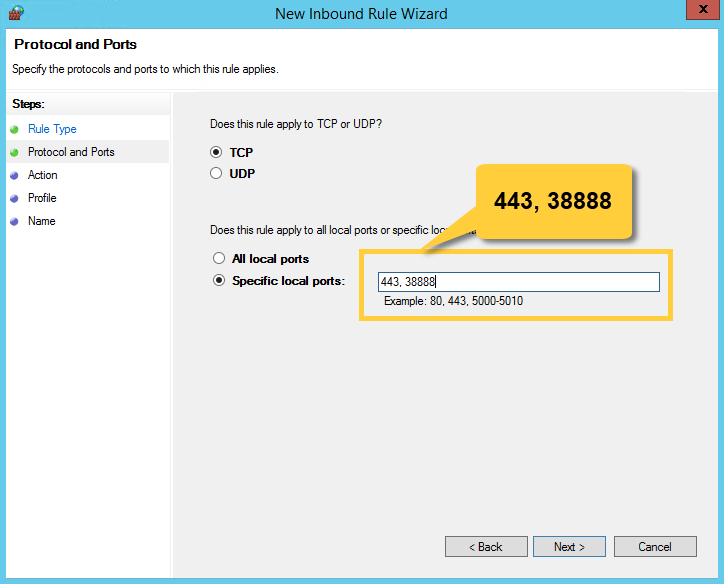 Create a new rule for TCP ports 443 and 38888 (or the ones you choose). First we need to download it. Dowload Chrome. 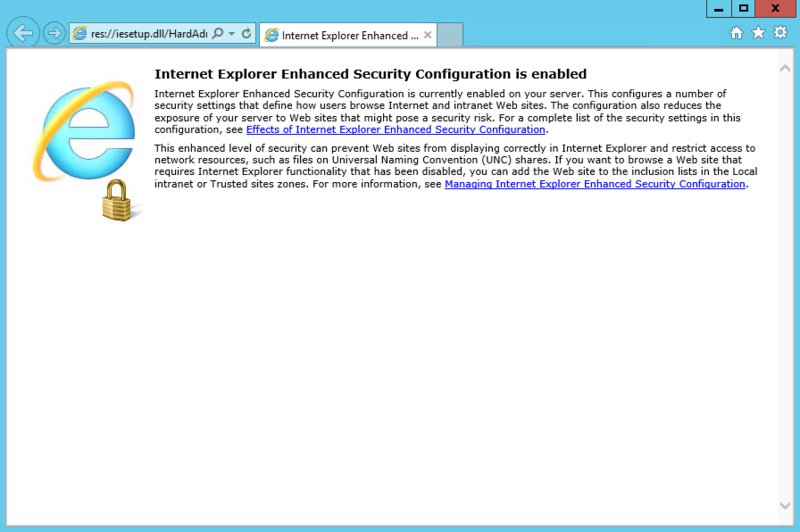 You will need to allow it in the Internet Explorer firewall. 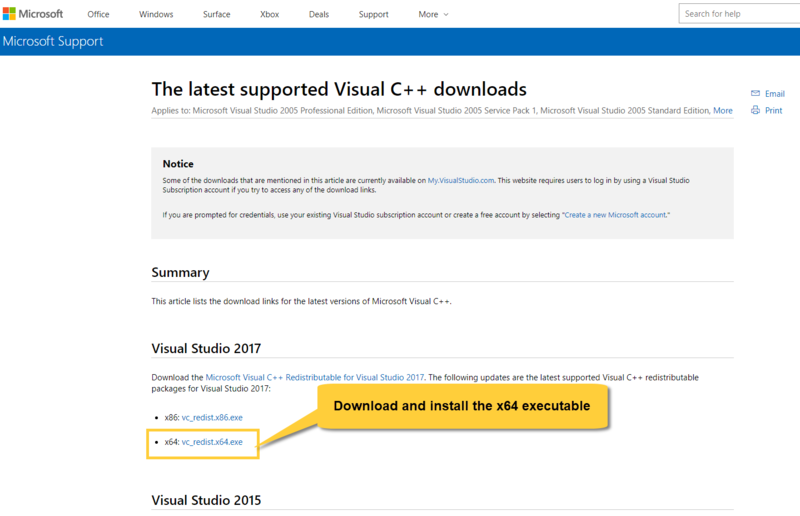 Install the Visual C++ 2015 Redistributable Package (or newer). 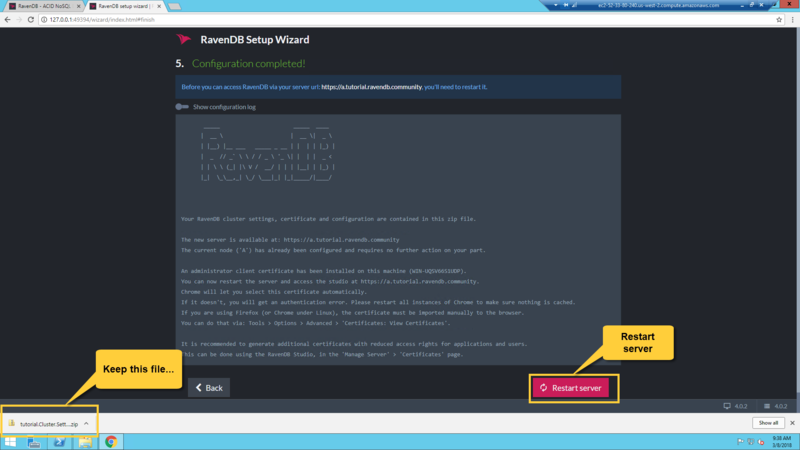 Download RavenDB and extract it to a path of your choice (e.g. C:\Raven4). 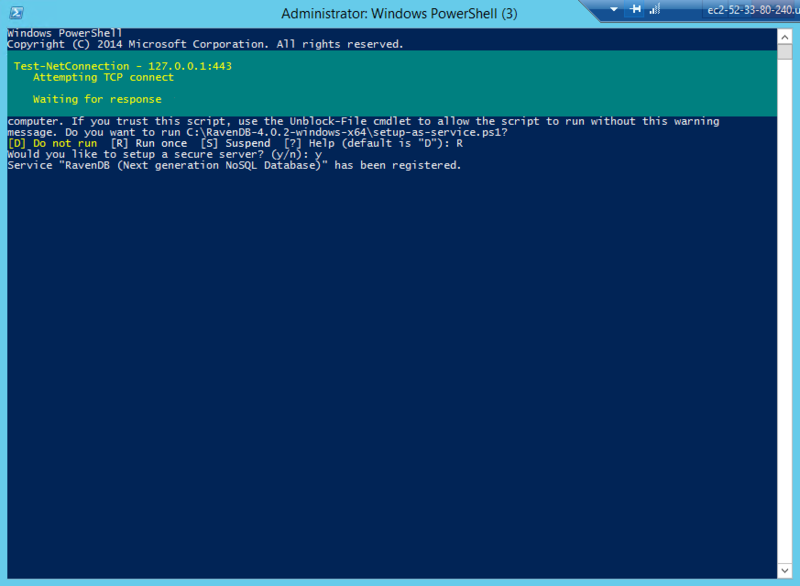 Open PowerShell and navigate to the extracted RavenDB folder. You can run the server as a console application by running run.ps1. 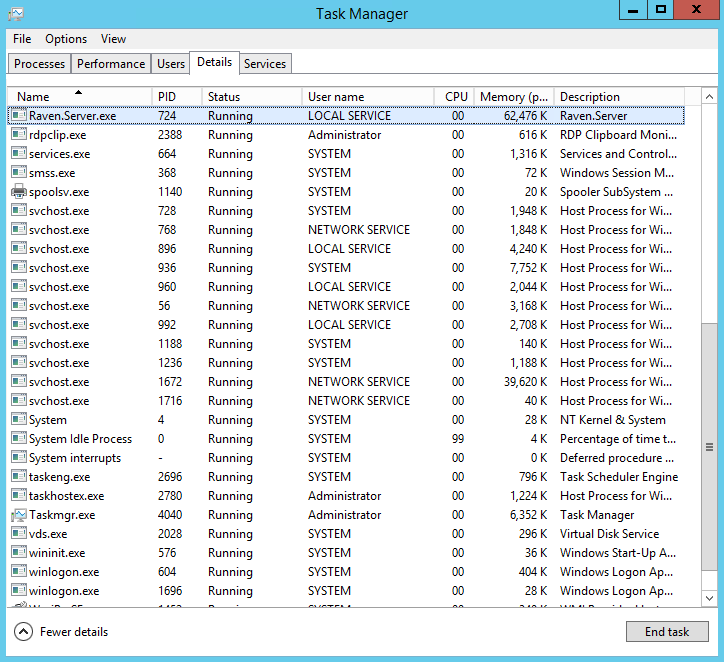 In this example we will run it as a service by running setup-as-service.ps1. When running the ps1 script you will have to confirm that you trust it. The service will be registered. 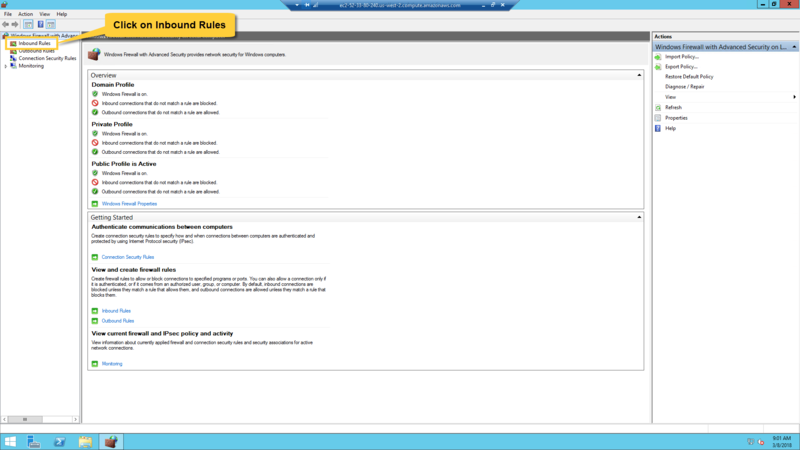 The server will start and you will be redirected to the Setup Wizard. Accept the agreement and choose the setup type you want to do. In the example we choose to setup securely with a Let's Encrypt certificate. You will need to claim your domain, read more here. 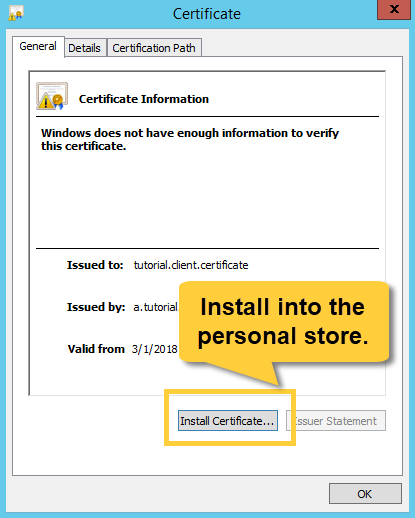 When the setup is finished you will receive a configuration ZIP file which contains an admin client certificate which will allow you to connect using the browser. Keep the file safe. Some environments (like this one) don't allow you to set the client certificate automatically in the setup wizard so if you are not redirected to the Studio and you get an authentication error, please close all instances of Chrome and install the admin client certificate manually. 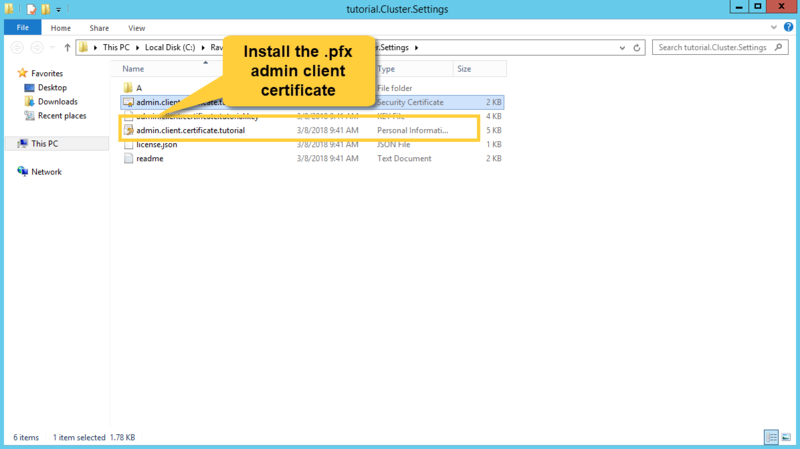 Double click on the certificate (from the extracted configuration ZIP file) and click next all the way through. 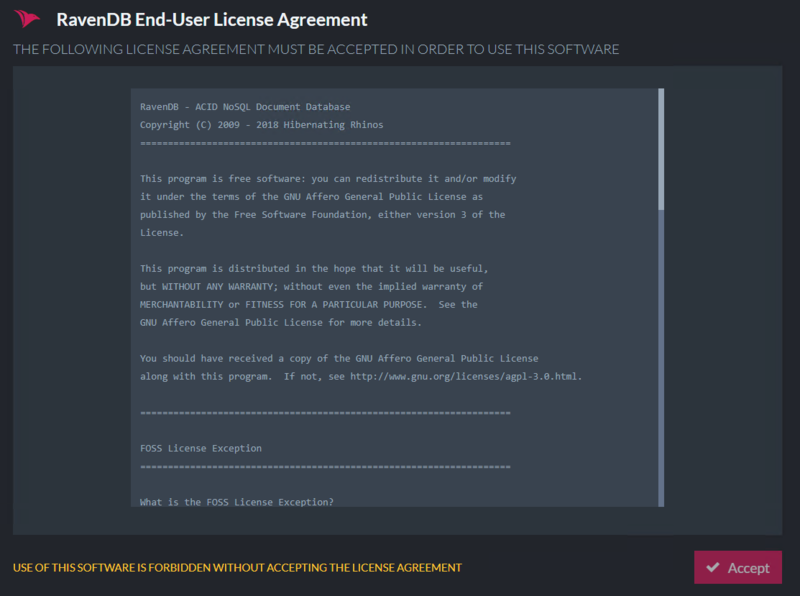 It will add it to the OS user certificates store. Now you can access the Studio. Open Chrome and enter your new domain (e.g. 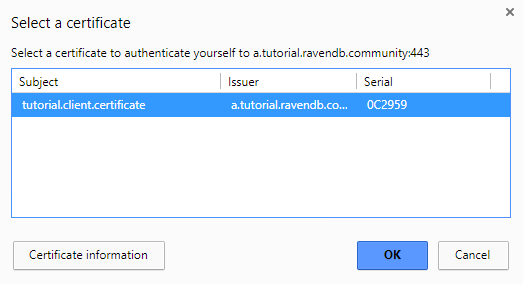 https://a.tutorial.ravendb.community). 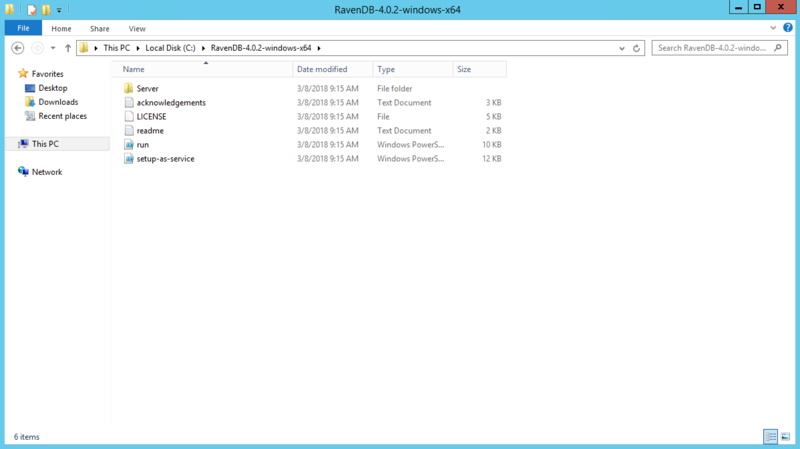 If you want to access the RavenDB CLI, first find out the RavenDB process number in the Task Manager and then open PowerShell and navigate to the server folder. Run the following command using the rvn tool.